Dearest readers, we have reached that point in Key West when the heat and humidity are so blazing and intense that even the most ardent sun-worshippers feel like the human equivalent of a baked potato as they bask poolside. Whereas in February, locals and tourists alike flock to the beaches and the pools in pasty droves, in August you’re far more likely to find everyone avoiding the scorching sun by any means possible. 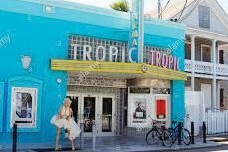 For the savviest among us, nowhere is better to avoid the midday heat than the Tropic Cinema (416 Eaton St., www.tropiccinema.com), one of the shiniest gems in Key West’s crown of interesting attractions. The Tropic Cinema opened as a twoscreen, nonprofit theater in 2004 with the singular goal of bringing independent and international films and cinematic classics to Key West’s artistically diverse island community. Over the last decade and change, the Tropic has evolved into not only a respite from the tropical heat, but a relaxing refuge from the barrage of noise, traffic and turmoil outside the welcoming cinema doors. The films are top-quality, the special events are plentiful, and the popcorn is always popping in the lobby. Oh, and did I mention you can grab a glass of wine or a beer and bring it to your seat with you? Let us not discount the therapeutic qualities of a gorgeous glass of pinot noir, a gourmet bar of chocolate and a film that transports you to another world altogether. For 10 successful years, Key West’s Tropic Cinema — consistently voted one of the best in the state of Florida thanks to its dynamite mix of special programming, charming décor, dedicated volunteer staff, curated film schedule and mouth-watering concessions — has soared under the watchful leadership of executive director Paul Melroy, its tight board and the diligence of its impeccable staff. Uniquely, most of the people who work at the Tropic are volunteers. They typically rotate during the course of the year, but Tropic Cinema has about 200 active volunteers. The huge volunteer base is a real testament to the community’s love of cinema in general and the Tropic in particular. For such a small cinema (the Tropic has one large screen, typically reserved for Hollywood blockbusters and special events, and three smaller screens), the quality and range of films the Tropic screens is impressive. As more and more people seek out comfort and theater quality, movie studios have had to evolve their historic film distribution practices. For decades, studios and big commercial movie chains have engaged in an unwritten practice called “clearance exclusives.” This means that commercial cinemas, such as the oftmaligned Regal Cinemas out in New Town, have dibs on the initial release of big studio films, and independent cinemas such as the Tropic don’t get to show them until they’ve left the chain cinemas. For example, the Tropic finally got to show “The Revenant” from 20th Century Fox after Regal Cinemas had screened it for six weeks. Today, four major studios, including Fox, have rejected clearance exclusives, so filmgoers have the opportunity to have a choice where they see a movie. In addition, small distributors are increasingly releasing amazing films most cinemas have never had access to before. The Tropic has been screening filmed ballet and opera for some years, but now it also screens filmed museum tours, architecture programming and artists’ monographs. This past winter, the Tropic also began screening Broadway musicals and plays and more. And just about every season, the Tropic hosts niche special events such as the “Classic Fright Nights” series — every Monday in October, the theater will show a classic scary movie for just $10 ($7 for members). One of the most wonderful things about the Tropic is its magical community component. Sure, you can watch a movie at home, but there’s something about watching a film in an auditorium with other people — even strangers — that brings it to life, and that makes it more true and real. And it bears repeating that the people are what make the Tropic unique: volunteers, members, the board of directors and staff, visitors from all over the world — they all bring the Tropic to life. The Tropic really does belong to the people of Key West and that is a special place to hold in a town so populated with transients and visitors year-round. The Tropic is so special because it is all about our community. The Key West Film Society started with a simple idea: show good films for people to watch together. That core idea is at the center of all the Tropic does, but it has grown so much over the last decadeplus. The theater hosts film education programs, visiting filmmakers (unsurprisingly, filmmakers love to come to Key West), birthday parties, concerts, and, of course, it likes to say that it shows the best films in the world. Sure, it might be a little artsy or independent, but don’t forget that the Tropic curates films for Key West in all its eccentricity. From Art House and independent films to Hollywood blockbusters, no cinema I know has a better range of films than the Tropic.